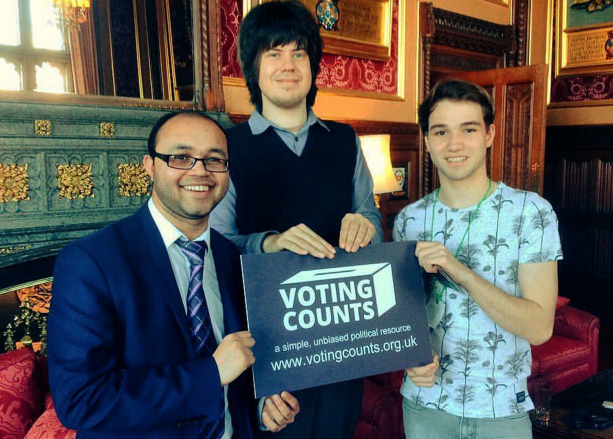 yath Ullah, Jack Welch, and Kieran Max Goodwin celebrate the launch of the UK VotingCounts website. Photo: World Youth Organization | Facebook. Kieran Goodwin and his partner Maliha Reza are the youngest CEOs of an international charity in the world—they’re both just 17. Their charity and Goodwin were recognized internationally when he was awarded the Diana Award for Champion Volunteers. Members can nominate volunteer opportunities to be featured, network with volunteer and career opportunities, and share their volunteer experiences. And all members must be under 25. Through the work they do, Goodwin wants to promote a more positive, uplifting view of today’s youth. He is interested in fighting the ugly stereotype that millennials wanting to be handed everything. He also says that, as a gay teenager, fighting stereotypes wherever they flourish is very important to him. Goodwin is a passionate volunteer himself. When he was 15, he and several friends swam the English Channel in a fundraiser for Cancer Research UK, which is one of the volunteer opportunities he features on his site. Others include speaking at the International Women’s Day Summit, assisting at conferences for youth entrepreneurs or against bullying, and the Young Reporter’s Program, a news site meant to make young voices heard on global topics. “Teenagers need a voice, they need opportunities and most of all a strong platform to build this on, which is what we hope WYO can offer,” says Goodwin in the World Youth Organization blog.